Last week I made the very hard decision to go back on medication for depression. This was not an easy thing for me to do, because I so detest the side-effects of antidepressants. But, the time had come to either do something or to go to bed and never get back out of it. Since we cannot afford for me to have a stint in the hospital or for me just to go to bed (we can’t afford for my husband to stay home from work to take the kids to/from school, or to come home from work every single time I have a breakdown and am crying hysterically down the phone), it was necessary to do something. So, yesterday, I bit the bullet and went to the doctor. I was officially diagnosed with severe depresion (scoring a 24 out of a possible 27 – the higher the score the more severely depressed you are) and was given the prescription. My attitude to it is this: I know how I am supposed to think, I know what and how I am supposed to think, but my brain will not work that way; it needs some serious help. This is the first step to getting better; this will open the door for me to be able to make myself think the way I should think. This is the first step – on a journey – to better days. I am a prisoner of depression. 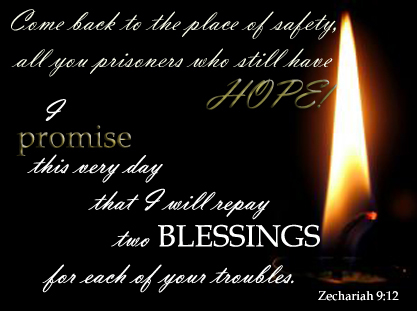 But, I still have hope, and I have God’s Word; His promise of blessing. No, I’m not happy that I’m on an antidepressant that I know, while it’s helping, will affect me in ways I do NOT want to be affected. But, I have hope of deliverance, from both the depression and, eventually, the crappy side-effects of the medication I have to take in order for me to cope with my every day life. Hope is not synonymous with wishing. Real hope is not the same thing as wishful thinking. The difference between hope and wishing is as much as the difference between a dream and a fantasy: the former is inherant with power and possiblility while the latter is just smoke and sandcastles. I still have hope. And, I have a promise which keeps that hope breathing. Dream A Little Dream Of… Me? Coulda. Shoulda. Woulda. The words of regret. I coulda been a star. I had all the talent and potential. I shoulda tried harder to get discovered, instead of waiting, hoping and praying to be discovered…one day. A day that never arrived. I had talent and potential but lacked opportunity, but I allowed that to stop me, and I shouldn’t have. I made excuses of not having the right connections, not having enough money to record a demo – and I didn’t… but I should have done more to get those connections, I should have begged, borrowed and stolen to get the money for the demo (okay, maybe not stolen). I always had plenty of wishbone but was always lacking in backbone! I woulda entertained millions instead of handfuls. I would have had money and been able to provide for the children I chose to bring into my world. I would not now feel the weight of so much of the talent and potential being wasted. Yes, I am not going to be one of those people who lie and say they have no regrets. Thankful. Hopeful. Determined. The words of a Dreamer yet unawake. Some might call that delusion, or deception. Yesterday, at church, we were encouraged by the pastor to not chase a “pipe dream”. But my dream was never a pipe dream. My dream was always, as long as I had youth and talent, definitely in the realm of possibilities. My dream is now a flicker, and no more than that… and, of the three of those words, I must admit that I could be a whole lot more of the latter two. But, my dream could never have been, or never be, called a pipe dream. And, it is a dream that, albeit just a flicker, doesn’t merely lie there languishing, waiting to die gracefully; no, it still gasps and fights for breath. Is it too late? Honestly? For worldwide celebrity, yes. I am definitely not in any delusion over that. Age and health as it is. I am no longer the little girl with the incredible voice. I am no longer the young woman with the incredible voice. I am now the tired, middle-aged woman that can still sing and still loves to perform. But, really, I ceased to “need” such a vast audience a long time ago. I am, truly, very thankful for the handfuls when I get them. I am really okay with limited “fame”…as long as it happens and as long it continues (without the stops and starts), that is…I’m happy as long as I am known – and will keep being known – for who I am and what I do/can do. What I do need, however, is a regular audience. What I mean is, I need a lot more frequency (and, paid gigs again would be nice, too…back to that wishing I could provide for my family with the only thing I can do)! Oh, yeah, and I do still need the money to record a proper CD. And, so, this is where those latter two words come in, being hopeful and determined to (at least try to) make that happen. I need help. I still can’t do this on my own. It’s all hoping against hope. And, as I say, I think my determination is still greatly lacking – I am still more wishbone than backbone – but the determination is there. The voice will be heard…and not forgotten. Last night I had a handful, and it was good. A friend of mine remarked how happy I looked. I told him that I am happiest and feel my best when I am performing. It was the best I had felt since the last time I had the chance to do what I both love, and am good at, doing. I so thoroughly enjoy performing. Not just singing. I do a lot of singing. And, I do enjoy singing…but, there is a certain high I get, a need I have, to perform – to “sell”, to “deliver”, a song. And that is not a need that is met – and, indeed, should not be – by what I do as a worship leader. What I get from leading worship is a hope that I have helped people engage and fellowship with the Most High. The focus there is not on me – I don’t want it to be – the focus is on the Lord, and His goodness and grace and our response to it. I love leading worship, and I feel I have been called and anointed to do it. It is my ministry, and I don’t do it just to have something in the realm of music to do! No, certainly not. But, there is a difference. And, I am simply being honest that I have a need in me to perform…because the ability is there and the passion is there. Yes, ability and passion I have in abundance. It’s the opportunities I crave. And, whenever I do get even a small opportunity, what it really does is just make me want MORE! Last night I opened our little programme with Dream A Little Dream Of Me. It’s such a delicious song to do – fun and flirty and vocally challenging all in one, a delight. It went over relatively well, whether or not it inspired anyone who was there (other than Jamie, of course) to dream of a certain redheaded contralto. But I am relatively certain that it is the redheaded contralto herself who was the biggest dreamer there… dreaming a dream of herself. I had that handful, and it was good, indeed, BUT, I am left aching… wondering when the next handful will be. It’s sort of like a one night stand… (right, ahem, I’ll just leave that analogy right there for ya).